BIOTEK maintains a quality management system which is regularly certified in accordance with the following international standards. These standards make the development, manufacturing and supply of products and services at BIOTEK more efficient, safer and cleaner and provide us with a technical base for health, safety and environmental regulations, helps us in technological advances and maintaining good management practices, disseminates innovation, safeguards consumers, and users in general, of our products and services and last but not the least makes life simpler by providing solutions to common problems. 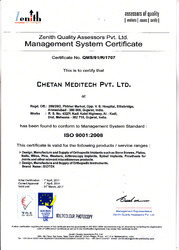 ISO 9001:2008 Quality management systems. 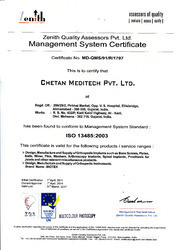 ISO 13485:2003 Medical devices - Quality management systems - Requirements for regulatory purposes. ISO 10002:2004 Quality management systems-Customer Satisfaction. CE marking- MDD 93/42/EEC Council Directive concerning Medical Devices. good technical base that is vital for health, safety and environmental regulations.